2 iPhone developers have uncovered a massive security flaw in the App Store. The rating of their apps dramatically dropped, so Patrick Thomson and Alex Brie looked into it and realized someone had been hacking into iTunes accounts to buy apps developed by someone called Thuat Nguyen. 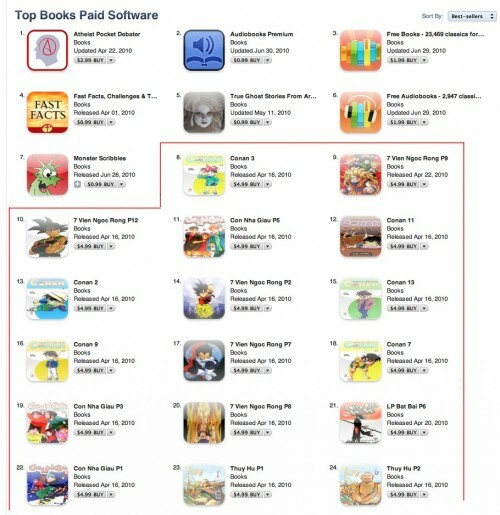 And so by doing this, the hacker was able to rank 41 of his apps in the top 50 of the Books category. Below is a picture of the extent of the problem. And the question remains, how has this developer managed to hack enough iTunes accounts to buy the number of apps required for each to dominate the paid books category on iTunes? Of course, by the time you read this, I’m sure Apple will removed these apps, and Apple will of probably give the money back to people who were hacked. So until this is officially fixed, the best option would be to change your iTunes password. 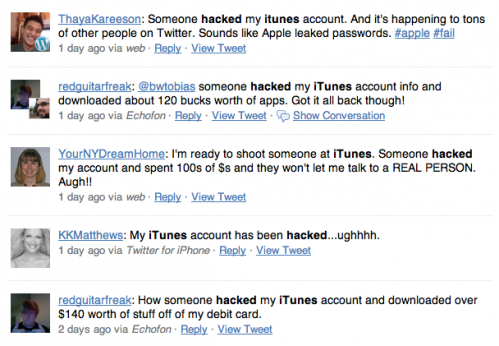 This is probably the first instance of the App Store being hacked. Unfortunately, this might not be the last we see of it.